Hogarth was a prolific artist from around 1720 to the early 1760’s, and his artworks have an immense amount of detail about the everyday life of people who lived in London in this era. He was also popular for his exploration of moral themes, depicting much of the degradation of society that he saw. Two of his works, published in 1751 and designed to be viewed together, contrasted the two popular alcoholic drinks of the time: Beer Street and Gin Lane. In the first half of the 1700’s there was a diabolical situation occurring in the lower classes of London. Gin (or geneva, as it was called) was being consumed in massive amounts by the poor, and had reached such catastrophic levels that 9,000 babies had been thought to die because of neglegent mothers forcing the alcohol down their throats. The process of distilling gin (of Dutch origin) had initially been encouraged in England at the beginning of the 18th century, as the distilling industry propped up grain prices which were very low. However, over the next 50 years the consumption of gin would increase to disproportionate and dangerous levels. The government of the day recognised the problem in the 1720’s, but there was no act of Parliament addressing the issue until 1729. This first Gin Act introduced high prohibitive taxes and made licenses for the sale of gin compulsory. Despite good intentions, the act was a failure as, by that stage, it was estimated that one in seven houses in the poorer areas of London were gin-sellers. The sheer quantity of sellers meant that the Excise men could not enforced the law or collect the taxes. In 1736 the second Gin Act was passed, which prohibited the sale of gin in quantities under two gallons. The immediate result of this was violent mob riots, and by the time the act was 2 months old, it was apparent that the real effect of the act was to increase the smuggling and underground selling of the liquor. In the seven years that followed, gin production rose by more than a third. In 1743 the third Gin Act was passed, but followed a different tack. The duties on gin and the cost of licenses for production were reduced in order to put a stop to the illegal selling of spirits. However, the act had indifferent success. It had stopped the black market trade of gin, but had not reduced the amount of production or the level of consumption, and by 1751 reform was again on the political agenda. Should the drinking of this poison be continued in its present height during the next twenty years, there will be by that time few of the common people left to drink it. In 1751 was the same year that Hogarth printed his pair of pictures, in an endeavour to bring to the attention of the public the consequences of drinking this vile liquor. 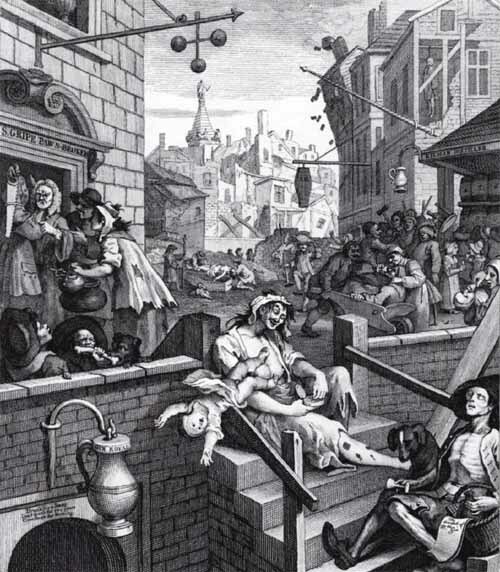 Gin Lane [below] depicts some of the effects of excessive gin-drinking on the society of London, mainly the working poor. Before you think that this portrayal is extreme, there were many, many documented cases of citizens drinking large amounts of raw spirits (turpentine) and being found dead the next day. There was even the case of Judith DeFoe, who murdered her child in order to sell the child’s clothes for money to buy gin. So, whilst we shudder to imagine it, all of Hogarth’s depictions may have had some basis in the contemporary reports of the day. This picture, set in the poor parish of St Giles, shows many aspects of the effects of the gin craze, as it is termed. In the foreground, a mother is busy gathering a pinch of snuff and is too drunk to care that her baby is falling out of her arms. The pamphlet-seller sits on the steps with her, malnourished and maybe dead, with the unsold moralising-pamphlet, “The Downfall of Mrs Gin”, in his basket next to a bottle of gin. The yawning entry to the gin cellar, the Gin Royal, has the enscription above the lintel “Drunk for a penny, Dead drunk for two pence, Clean straw for nothing.” A pawnbroker, Gripe, to the left of the print, buys a carpenter’s saw and a woman’s cooking utensils so they can buy more gin. To the right of the picture, a mother is pictured pouring the liquid into the mouth of her baby. The houses are in decay and ruin, and a person’s body is visible through an upstairs window of one house. In the background, there is a baby impaled on a spike, a woman’s body being loaded into a coffin, and a brawl in the street, among other things. 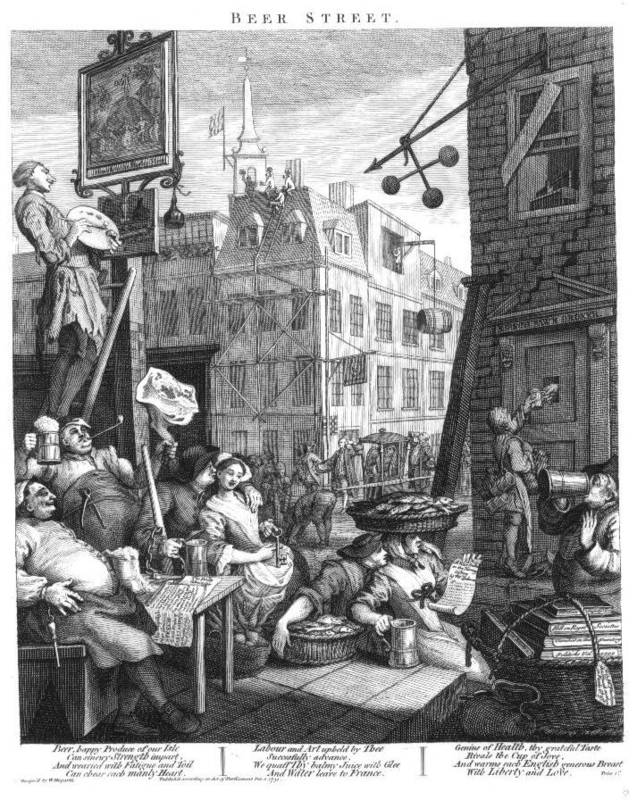 In contrast, Beer Street shows the reletive harmlessness, and even affluence, of the practice of beer-drinking in 18th century London. In Beer Street, people are well nourished, happy and working, though they are pictured resting from their labours with their tools of trade around them. The only person who is poor is the pawnbroker, Pinch, who has no customers. Beer is also portrayed as a British drink, compared to the foreign Geneva spirit. In 1751 the fourth Gin Act increased the duties on gin and the price of licenses slightly, with the focus on pushing out the small time sellers of the alcohol. Within a year, the quantity of gin production dropped for the first time in twenty years. Maybe this is a testament that prohibition does not always work! I quite like Swift’s work! I hadn’t read A Modest Proposal before, but your version is great. And the picture is really a perfect illustration too.